Dakar –The third edition of the Global Migration Film Festival (GMFF) kicked off in West and Central Africa on November 28 in Nigeria as the UN Migration (IOM) celebrates the longstanding symmetry – and drama – of migration and film-making, a marriage that now is more than a century old. The opening of the Festival in West and Central Africa took place in Abuja, Nigeria (28/11). Close to 200 cinephiles attended the event featuring the short film Granma, by Nigerian filmmaker Alfie Nze and the documentary Bushfallers – A Journey of Chasing Dreams by Nils Benjamin Keding. The films were followed by a panel discussion with representatives from IOM, the Nigerian government, as well as Nigerians who shared their experiences in Libya. IOM teams are planning events like the one in Lagos to unfold across the length and breadth of the continent. Besides Nigeria, IOM’s West Africa missions will be hosting celebrations in 12 more countries – from Mauritania to Cameroon – between 28 November and 18 December. In total, over 40 screenings are planned across the region, in capital cities as well as in remote areas. 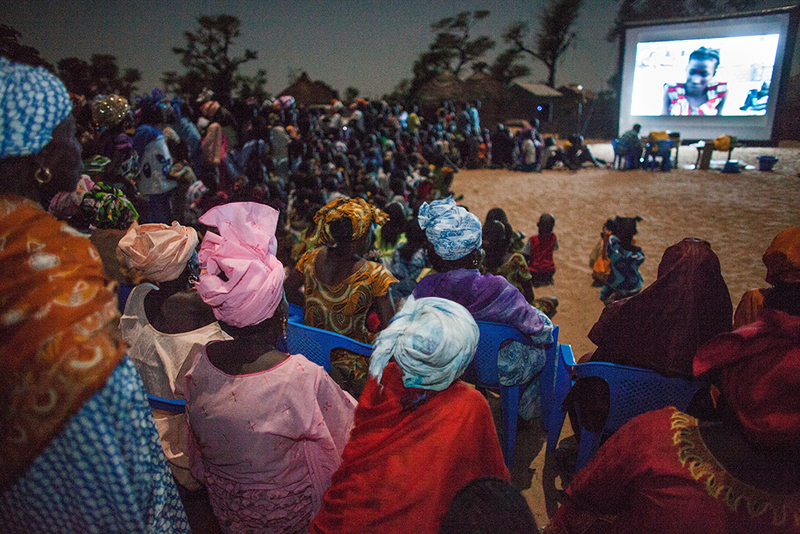 In Niger, IOM is partnering with Cinéma Numérique Ambulant, an itinerant movie and theatre company, to organize film screenings in ten cities across the country. Theatre and dance shows are also planned across the six transit centres in the country. In Côte d’Ivoire, the festivities will take place on International Migrants Day (18 December) and will include a screening, an art exhibition and testimonies from migrants and diaspora Ivorians. An awards ceremony for the most compelling migration success-story is also scheduled. In Senegal, the Regional Office together with the United Nations Information Centre will organize an event on 13 December in Dakar to celebrate the dignity and protection of migrants in the region, whose youth are taking risks to migrate irregularly in search of greener pastures. The closing ceremony of the GMFF will take place in Ouagadougou, Burkina Faso on 18 December. The ceremony will award the best African Francophone film showing the complexity and reality of migration. Brasília – After the official launch of the Global Migration Film Festival on Wednesday (28/11), Brazil opened this year’s exhibitions season of the festival with Brazilian productions, educational partnerships and debates. Flowers of Hope (2016), the story of a group of Malagasy women who were victims of human trafficking and overcame their fear to tell their own stories of forced marriage and domestic slavery in a counter-trafficking documentary produced during the IOM’s GMFF Participatory Video Project, opened this year’s festival in Brazil. Three other screenings will occur in Pacaraima on 2 December, Boa Vista on 6 December, and Rio de Janeiro on 11 December. Boa Vista and Pacaraima, located in Roraima, on the border with Venezuela, were chosen for their importance on the recent migration in Brazil and concentrate most of IOM’s activities. From April to November this year, more than 3,000 Venezuelans arriving in northern Brazil have been relocated through the Federal Government’s strategy with the support from IOM Brazil and other UN Agencies. In addition, over 15,000 Venezuelans have been provided with guidance on documentation and regularization, and other humanitarian assistance. On 11 December, a special screening of the selected short films will be happening at the Fundação Casa de Rui Barbosa (a think tank from the Ministry of Culture), in Rio de Janeiro, to kick off the IV Summer Course on Migration and Asylum with the theme “Asylum in a Global Perspective”. The classes aim to promote an immersion forum for the exchange of ideas, networking, introduction to new political approaches and development of the subject. After the exhibition, participants will also attend a debate with IOM Brazil’s staff member, Guilherme Otero and other specialists. Following the example of “Flowers of Hope”, some of the films and documentaries were directed and produced by migrants or refugees, their stories bring dramatic, poignant and comic views of migrants to various audiences through images that arouse feelings among people of all cultures. The other selected short films for these exhibitions are “Brasiguaios” by Marcos Estrada, that tells the life story and identity of a group of Brasiguaios (Brazilian migrants in Paraguay) that is marked by the pursuit of land for agricultural production in Brazil or Paraguay; “Somos Un” a collaborative short film produced by Waraos and Eñepas to strengthen the integration of these two indigenous groups living in the same area and sharing stories; and “Riding 'The Death Train' to America's border”, a view on migrant policies. According to IOM Brazil Chief of Mission, Stephane Rostiaux, “The IOM Migration Film Festival allows greater understanding and different perspectives to connect a wider audience to the challenges and possibilities of migration.” He added: “This is also a great chance for people to get to know more on the Warao population in northern Brazil,” making a reference to 'Somos Un’, a Brazilian production. Brazilian exhibitions agenda is available on GMFF’s website. The Global Migration Film Festival is supported by PLURAL+, a youth-produced video festival, and MigApp, IOM’s mobile application for migrants. Click here for a complete list of the 2018 official selection and watch the GMFF 2018 Trailer. Launched in 2016, the GMFF celebrates the connection between cinema and migration. Professional and emerging filmmakers are invited to submit films about the migrant experience according to the established theme. This year, eight movies from the official selection tell the tales of African migration. Most of the screened films reflect the complexity of migration between dreams and realities, social pressure and search for freedom. Follow the events in the region on social media: Twitter and Facebook.